Previously in Green Arrow: Green Arrow murdered the super-villain Prometheus, which enraged the rest of the hero community in a slightly bizarre plot contrivance, considering most of them had blood on their hands as well. His identity as Oliver Queen revealed to the public and his good name besmirched, he retreated into the mysterious Star City Forest that was created by the White Lantern in Brightest Day. Now he has emerged again into the city to reclaim his rightful place as the hero of Star City. 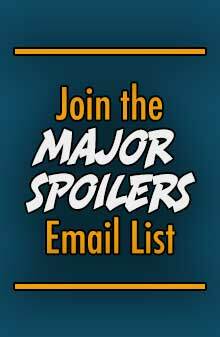 As we approach the September DC Relaunch, some of the creative teams are taking a few months off their titles so they can build up the prerequisite relaunch buffer of three issues. J.T. Krul and Diogenes Neves are both working on new titles in the relaunch, so now we have James Patrick and Agustin Padilla. Given the time-frame for events, it isn’t necessary for them to make a huge impact on the world of Green Arrow, or make any sort a game-changing story. What needs to happen is a short story that is fun to read, and from this first issue that seems to be what is happening, with a few drawbacks. I was very confused by the first page of this issue. Rather than opening up with the Emerald Archer or any of his currently depleted supporting cast, we open up with what appears to be a teenage girl in a doctor’s office. It is later implied that this is an abortion clinic, and in the last panel of the page it explodes. We find out a bit afterward that the explosion was caused by followers of the cult leader Reverend Billy Miggs, who has taken it on himself to enforce his own sense of morality and religion, through force whenever necessary. None of this chain of events is explicitly explained; it is left to the reader to put together the pieces of the somewhat vague puzzle, and I felt the storytelling suffered a bit from not being clear enough. 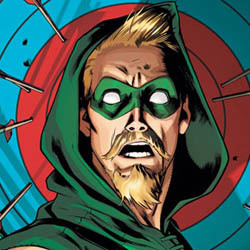 Green Arrow has several flashbacks to a rather morbid piece of new history for him in which he tested out the effect that arrows with broad head tips have on human flesh. Apparently he got cadavers from a morgue that he used for target practice, observing how the sharp arrow heads would pierce the body and what they did to various aspects of human anatomy. The flashback is a little odd, though an interesting albeit inconsequential exploration into Oliver Queen’s character, and not appropriate for small children to see. I believe this sequence is leading up to a move, at least for this brief arc, of Ollie going back to trick arrows. During Mike Grell’s run on Green Arrow, the Emerald Archer moved towards regular arrows with a classically pointed tip, rather than the goofy boxing glove arrow or grappling hook arrow. During Kevin Smith’s revival, the trick arrows were brought back, but in J.T. Krul’s run with the emphasis on Green Arrow as a hunter, his quiver was necessarily brought back to hunting arrows. The subject of the damage an arrow can do to a human is brought up repeatedly, and Oliver refrains from taking a kill shot in a trouble situation, leading to the Reverend escaping and having an opportunity to set himself up as a bigger bad guy. Overall the story is good, but not great. It’s nice to have a different perspective on Green Arrow since Krul has been writing him for the better part of two years now, but the storytelling was vague at times and some of the character development was lacking. It is about what one should expect from a filler. The art in the issue is about like the writing; again, good, but not anything special. 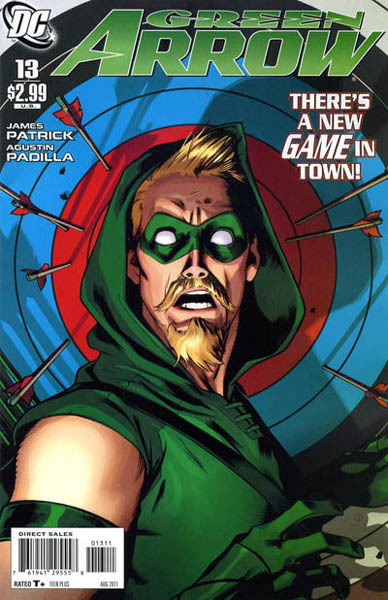 Padilla draws the Emerald Archer well, albeit with someone inconsistently structured facial hair. I really enjoyed Josh Middleton’s cover art for the issue–it felt very reminiscent of Judd Winick’s run on Green Arrow. Unfortunately this brightly colored fun art style didn’t carry over into the issue; most of the colors were muted and somber. There really isn’t a whole lot I have to say about the art; I would certainly have no objection to Padilla drawing Green Arrow in the future, as he’s a capable artist, but there wasn’t anything that really wowed me. 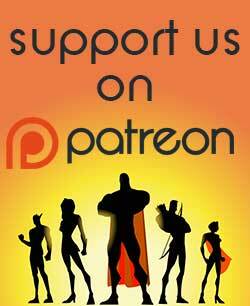 After the relaunch we’ll have Dan Jurgens on pencil duty, which has a lot of promise. 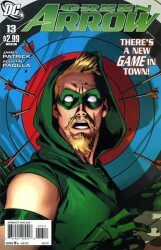 This issue of Green Arrow earns 3 stars from me; I feel like a broken record, but I’ll go ahead and say it one more time–the issue was good, not great, but that’s oftentimes the best case scenario for a filler issue. I enjoyed it a lot more than I enjoyed the Adam Beechen Zatanna filler issue this week, though a lot less than the Zatanna filler issue by Matthew Sturges and Stephane Roux a few months ago (Zatanna #12, I believe). I was hoping for more, but expected less, and am hesitantly optimistic about the rest of this arc. I’m sorry. That cover looks like he’s doing a bad impersonation of Alfred E. Newman. Bring on Green Arrow, Inc.
An infomercial supervillain totally needs to happen. Billy Mace is a WW II hero in Bendis’ Bi-Annual comic Powers. Is it bad that I’ve stopped reading all DC books, Except Batgirl and Batman Incorporated? 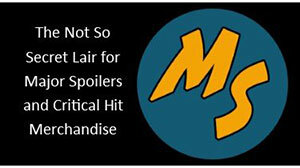 Figure it won’t hurt to wait for the relaunch. I’m still reading all my normal stuff, but I’m considering dropping Zatanna because I really didn’t care for this Beechen issue, and if he’s on it until the relaunch I don’t have a burning desire to keep going on that. If you’ve enjoyed a comic up to this point, and you’re at least moderately happy with the creative team on it until the relaunch, there’s no reason to drop it; it should still be an enjoyable read, and isn’t that what comics are all about?